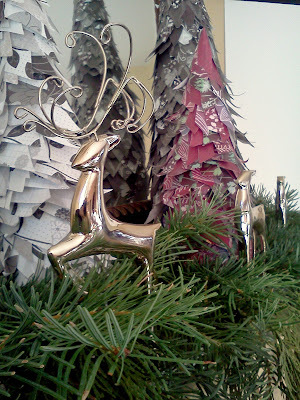 Christmas has been creeping into our home in small bits and pieces. I wish I could say I was uber organized and had everything done over Thanksgiving weekend, but the reality is very different. 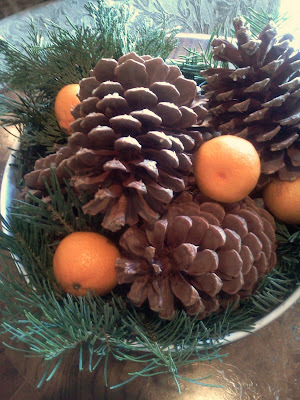 Our tree is still undecorated, the kitchen is a work in progress and the entry is still cloaked in its fall glory. BUT, the outdoor spaces are done! You can see the Reindeer Pen here, and here. And, the mantel is complete. 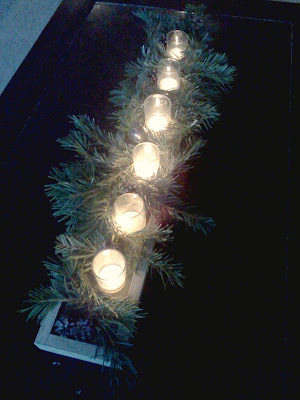 Our coffee table has a small trough of votives, greenery and heirloom brass bells. 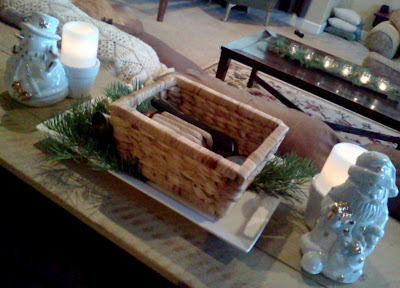 The sofa table has a santa and snoman flanking our all important remote control basket. A couple more heirloom bells are tucked into the greenery. My maternal grandmother, Gertie, collected bells. She had hundreds and hundreds when she passed a couple of years ago. These are just a few that she passed on to the girls and me. I believe in keeping a little family history at the forefront of our holidays. My grandmothers bells are a natural. Speaking of natural...lots and lots of greenery have been tucked into corners and crevices. In this case I paired it with a few pine cones and satsumas for a completely natural display. No history, just good, ol' fashioned nature. Simple, easy and inexpensive. That's my kind of decorating, no matter the season! And the dollar store birds that migrate from room to room. 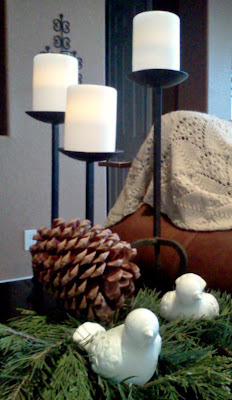 For now, they are nesting in some fresh pine and cedar sharing the stage with a set of iron candle sticks with dollar store led candle pillars. The dollar store has definitely been my friend this holiday season. As has a lot of DIY projects. Right now this ranks as one of my favorites. 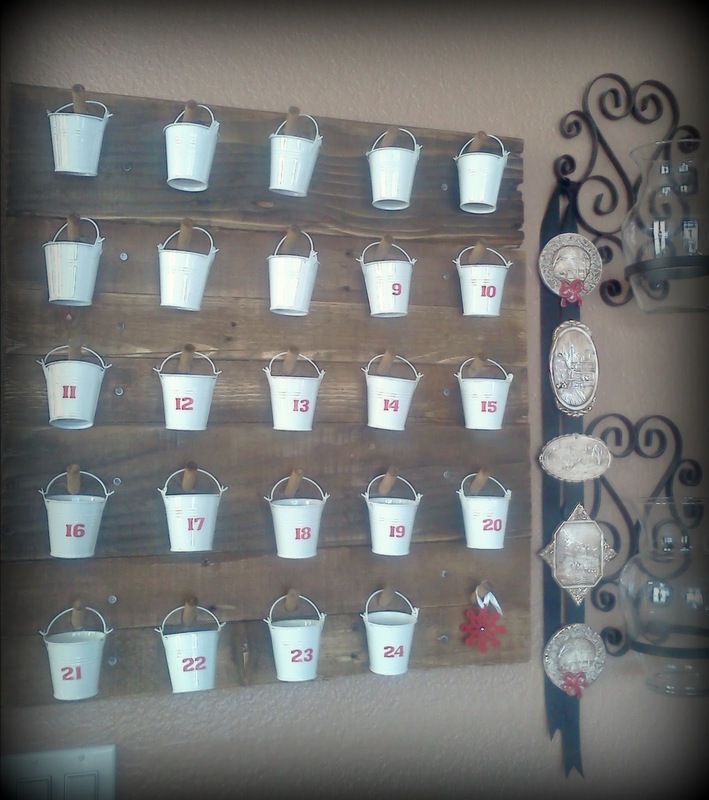 I was showing hubby all of the amazing advent calendar ideas that have been floating in blogland and he said he would build me a peg board of pallet wood for displaying small buckets. It took him a while t get around to actually doing it, but he finally gave up a Saturday morning and pulled apart a rather troublesome pallet. Not much of the wood was useful; most of it splintered horrible. He managed to salvage enough though. Once it was built I gave it a quick sanding with my trusted palm sander and slapped a messy coat of stain over the whole thing. 8 packages of dollar store buckets and a package of red letter/number stickers and we called it good. 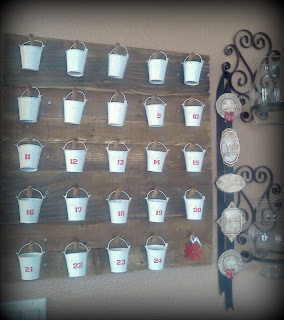 Mounted to the ribbon are ceramic ornaments my paternal grandmother made. I grew up painting in her studio and have many wonderful pieces from her. Ceramics and canvases. Not to mention cherished memories...I wish my girls could have known her, but cancer took her from us when she was far too young. We keep her spirit alive in our hearts and our homes. 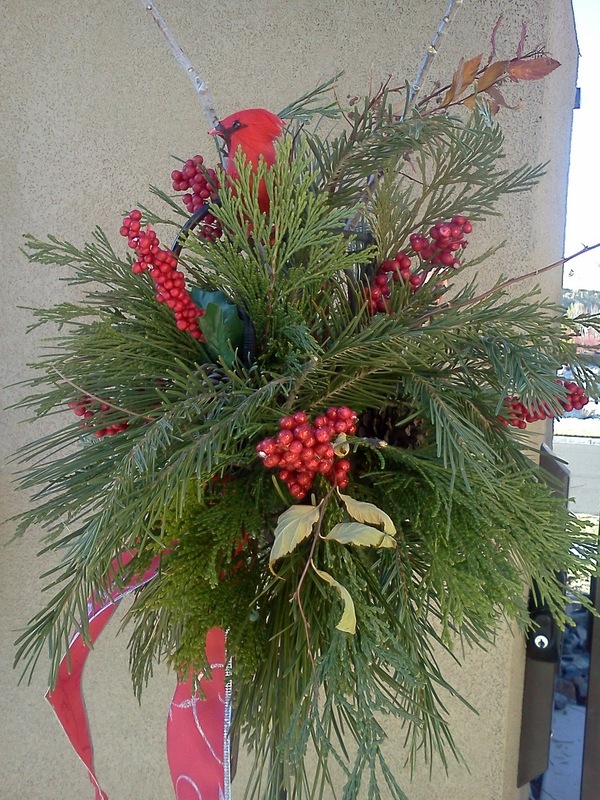 The holidays are a natural time to display many of her creations. May she look upon them with a smile!